NetChess is a chess program that allows you to play with opponent over internet/intranet or on the local computer. You can load or save game. The built-in chat provides a quick and efficient solution to essential communication between players. 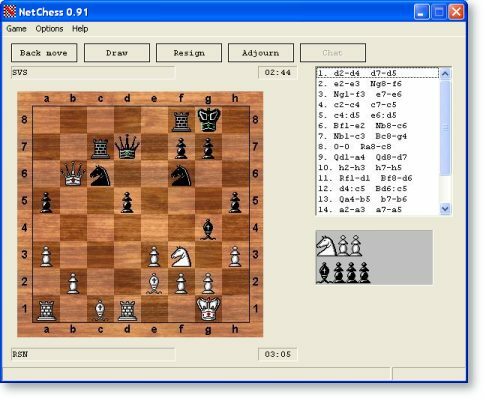 This software will verify your moves according to chess rules. Features include chess-clock, move logging, coordinate system, and much more. NetChess is one of the FreeDownloadsCenter's Top Ten board games. Playing PC games is harmful, and that's a fact. To reduce harmful effects you should choose games, which were created for developing your brain, reaction, logical thinking and so on. You can find the greatest variety of such games in the Internet, but the real champion in all meanings is chess game. Legendary game is now available on PC! NetChess - do you want anything else? This is a good, simple in usage game for two users, who want to spend their time usefully. Unzipping the file with this game, you will think about IP addresses and other stuff, which seems to be very hard to be understood. Never mind! Everything is more than clear. Smart interface of NetChess won't let you get tired of difficulties. The game should be played by means of direct connection, in the Internet or through the intranet. The one who is "creating" the game will play with white figures, the other, who is joining the game by selecting the IP address of his or her partner will take black figures. The chat mode is included, so you may comment your or your mate's moves. You can also cancel the move, if your partner isn't against it. You may offer a draw to your partner. You may... Ok, the rest is better to see once, than to read twice. Enjoy the chess game!